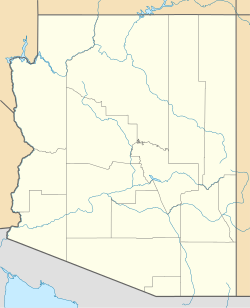 Oatman is a village in the Black Mountains of Mohave County, Arizona, United States. Located at an elevation of 2,710 feet (830 m), it began as a small mining camp soon after two prospectors struck a $10 million gold find in 1915, though the vicinity had already been settled for a number of years. Oatman's population grew to more than 3,500 in the course of a year. Oatman has the ZIP code 86433; the Tabulation Area had a population of 128 at the 2000 census. After a few other names were passed over, "Oatman" was chosen for the name of the town in honor of Olive Oatman, a young Illinois girl who had been taken captive by Indians during her pioneer family's journey westward in 1851 and forced into slavery. 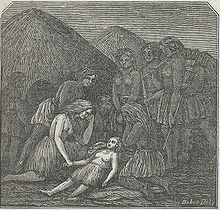 She was later traded to Mohave Indians, who adopted her as a daughter and had her face tattooed in the custom of the tribe. She was released in 1856 at Fort Yuma, Arizona. In 1863, mountain man and prospector Johnny Moss discovered gold in the Black Mountains and staked several claims, one named the Moss, after himself, and another after Olive Oatman, whose story was by then well-known. For the next half-century, mining waxed and waned in the remote district until new technology, reduced transportation costs, and new gold discoveries brought prosperity to Oatman early in the 20th century. The opening of the Tom Reed mine, followed by the discovery of an incredibly rich ore body in the nearby United Eastern Mining Company's property in 1915, brought one of the desert country's last gold rushes. The boom of 1915-17 gave Oatman all the characters and characteristics of any gold rush boomtown. For about a decade, the mines of Oatman were among the largest gold producers in the American West. In 1921, a fire burned down many of Oatman's smaller buildings, but spared the Oatman Hotel. Built in 1902, the Oatman Hotel remains the oldest two-story adobe structure in Mohave County and a Mohave County historical landmark. It is especially famous as the honeymoon stop of Clark Gable and Carole Lombard after their wedding in Kingman on March 18, 1939. Gable fell in love with the area and returned often to play poker with the miners. The Gable-Lombard honeymoon suite is one of the hotel's major attractions. The other is "Oatie the Ghost." Actively promoted by the hotel's current owners, "Oatie" is a friendly poltergeist whose identity is believed to be that of William Ray Flour, an Irish miner who died behind the hotel, presumably from excessive alcohol consumption. Flour's body was not discovered until two days after his death, upon which it was hastily buried in a shallow grave near where he was found. 1924 would see United Eastern Mines, the town's main employer, permanently shut down operations after producing $13,600,000 worth of gold at the then-government-controlled market value of $20 per ounce; in today's gold market price of $1300 per ounce, the equivalent value is over $850,000,000. The district had produced $40 million (or approximately $2,600,000,000 in today's market price) in gold by 1941, when the remainder of the town's gold mining operations were ordered shut down by the U.S. government as part of the country's war effort, since metals other than gold were needed. Oatman was fortunate insofar as it was located on busy U.S. Route 66 and was able to cater to travelers driving between Kingman and Needles, California. Yet even that advantage was short-lived, as the town was completely bypassed in 1953 when a new route between Kingman and Needles was built. By the 1960s, Oatman was all but abandoned. Oatman has undergone a tourism renaissance of sorts in recent years, thanks to burgeoning worldwide interest in Route 66 and the explosive growth of the nearby gaming town of Laughlin, Nevada, which promotes visits to the town. Oatman's most famous attractions are its wild burros, which freely roam the town streets and can be hand-fed hay cubes otherwise known as "burro chow," readily available in practically every store in town. Though normally gentle, the burros are in fact wild and signs posted throughout Oatman advise visitors to exercise caution. The burros are descended from pack animals turned loose by early prospectors, and are protected by the U.S. Department of the Interior. Weekends in Oatman can see anything from classic car rallies to mock "Wild West" shootouts right down the middle of old Route 66. Independence Day celebrations include a contest, known as the Oatman Egg Fry, where participants attempt to cook an egg on the sidewalk with the aid of solar devices. Oatman is fiercely proud of its Route 66 heritage and replicas of 66's black-on-white U.S. highway shield are posted all over the town. Route 66 souvenirs abound and many tourists have pasted autographed one-dollar bills on the walls and ceiling of the Oatman Hotel's bar and restaurant. Estimates of the number of bills run into the thousands. 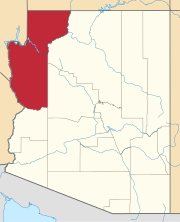 From Laughlin, Needles or Bullhead City, Arizona, Oatman is a short drive on State Route 95 to its intersection with Boundary Cone Road in Fort Mohave. About 10 miles (16 km) east of SR 95, Boundary Cone Road meets with old 66, now named the "Oatman Highway." Oatman is only about four miles (6.5 km) from there. Oatman has a high desert climate, significantly cooler in both summer and winter than the Colorado River lowlands to the west. In summer, while the Colorado River Valley may be sweltering in temperatures well above 100 °F, Oatman is often 10 or more degrees cooler. ^ Paher, Stanley (1980). Northwestern Arizona Ghost Towns. Las Vegas: Nevada Publications. pp. 24–31. ISBN 0-913814-30-X. ^ Varney, Philip (April 2005). "Mohave Ghosts". In Stieve, Robert. Arizona Ghost Towns and Mining Camps: A Travel Guide to History (10th ed.). Phoenix, Arizona: Arizona Highways Books. p. 39. ISBN 1-932082-46-8. Wikimedia Commons has media related to Oatman, Arizona. Wikivoyage has a travel guide for Oatman. This page was last edited on 30 September 2018, at 16:43 (UTC).